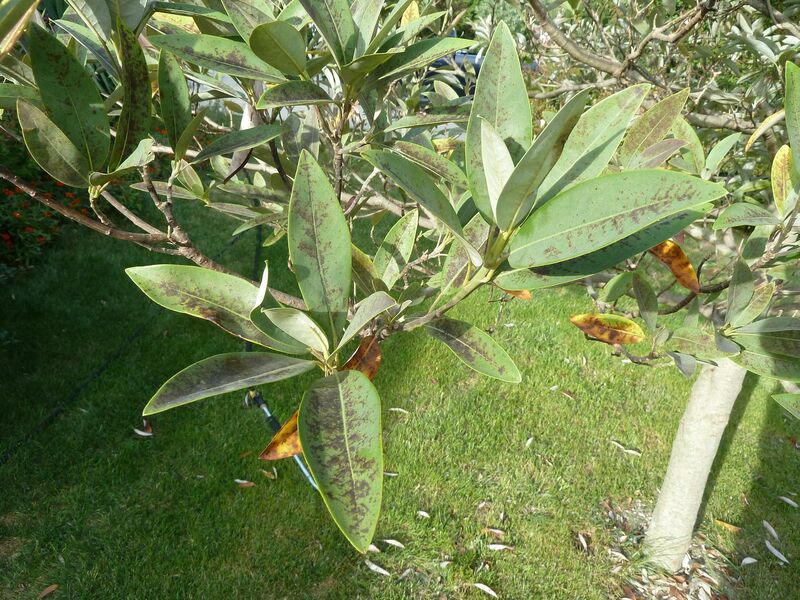 A lot of Magnolia virginianas around here got Sooty Mold on their leaves and that caused many to fall off extra early (I think I posted about mine having leaf spots and dropping leaves before - see photo). I just completed a Master Gardener program and I was lucky enough to get my tree diagnosed and find out what causes Sooty Mold. It is apparently caused by aphids or scale damaging the leaves. They in turn release "honeydew" from their chewing, from the leaves above, and this causes the growth of Sooty Mold on the leaves below. And this is common after late summer droughts (Magnolia virginianas can be stressed easily in summer, when growing on normal lawns that go dormant from drought). So check the leaves on your tree. If you are seeing some spotting, it could be sooty mold. I was told by the entomologist that teaches in our Master Gardener program that aphids / scale on Magnolias can be controlled (and sooty Mold eliminated) by applying a soil drench pesticide around July 1. Any earlier and the pesticide could affect the flowers / pollinators but any later and it might not be taken up by the tree in time for the late summer aphids and scale.